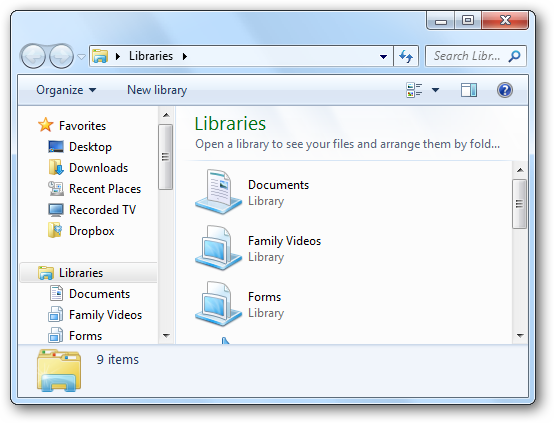 When you open Windows Explorer from the Taskbar in Windows 7, it defaults to the Libraries view. 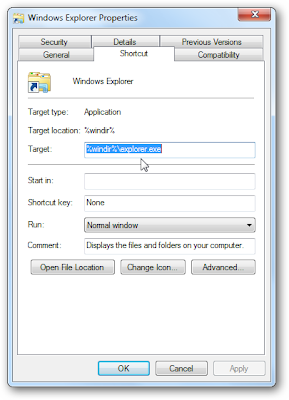 Today we take a look at changing the target path to allow you to customize which location opens by default. 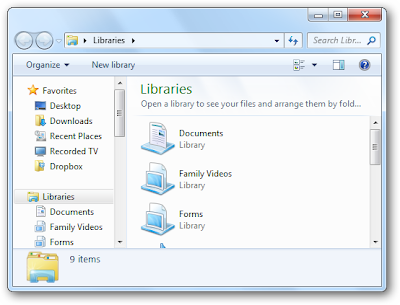 When you click on the Windows Explorer icon on the Windows 7 Taskbar, it’s set to open to the Libraries view by default. 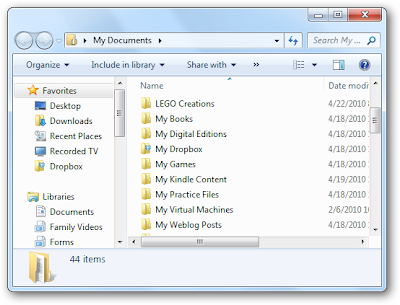 You might not use the Libraries feature, or want to set it to a different location that is more commonly used. To change the default startup location for the Windows Explorer Taskbar icon, if you have no Explorer screens open, hold down the Shift key, right-click the Explorer icon, and select Properties. 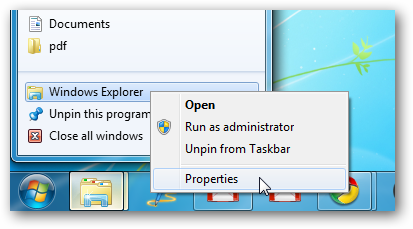 Or if you have Windows open, right-click on the Explorer icon to bring up the Jumplist, then right-click on Windows Explorer and select Properties. Windows Explorer Properties opens up and you’ll want to click on the Shortcut tab so we can change the Target. A common place you might want it to default to is your Documents folder. So to do that we need to enter the following into the Target field. 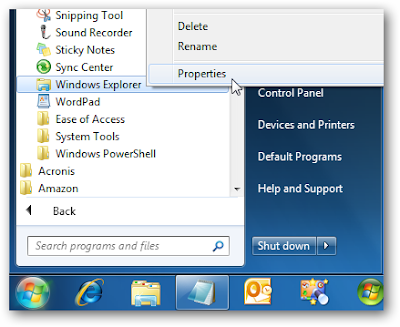 If you use the Start Menu to access Windows Explorer, open the Start Menu and go to All Programs \ Accessories and right-click on Windows Explorer then select Properties. Change the target path to where you want it to go. In this example we want Windows Explorer to open up to My Computer so we entered the following in the Target field. You can set it to open to various locations. For instance if you wanted to mess with someone at work, you could enter the following and Explorer will always open to the Recycle Bin. 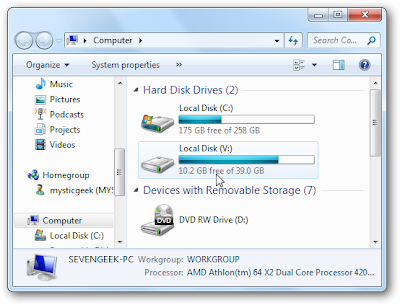 Here we showed you a couple of commonly used locations that you might want Windows Explorer to open to instead of Libraries. You can set it to other locations if you know the GUID (Globally Unique Identifiers) for the object or location you want it to default to. For more on using GUIDs check out The Geek’s article on how to enable the secret “How-To Geek” mode in Windows 7. 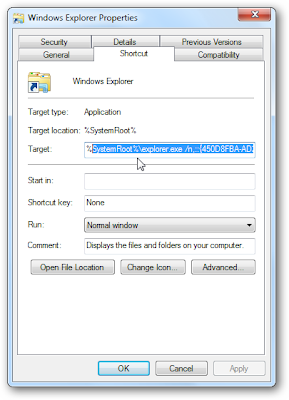 Actually it’s just a play on the so-called “God Mode” for Windows, but there is some good information, and a list of some locations you might want to have Windows Explorer open to.